1. 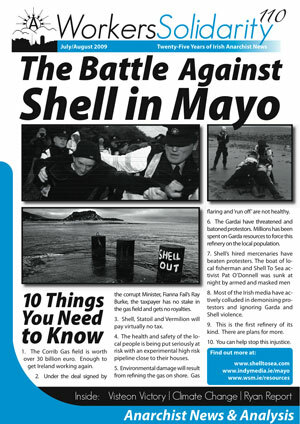 The Corrib Gas field is worth over 30 billion euro. Enough to get Ireland working again. 2. Under the deal signed by the corrupt Minister, Fianna Fail’s Ray Burke, the taxpayer has no stake in the gas field and gets no royalties. On RTE news on 18/5/09, Mary Hanafin stated, in her usual Orwellian fashion, that the Department of Social and Family Affairs (DSFA) had now provided a financial incentive to encourage those under 20 to go into training or education. This ’financial incentive’ involved cutting the dole to €100 per week for new claimants under the age of 20. The occupation of the Visteon motor parts factory in Belfast ended on May 3rd when the company gave in and agreed pay extra compensation of between six month’s and nearly two year’s money to the workforce for the loss of their jobs. At the time of going to press, only 14 of the 115 Romanians targeted in racist attacks in Belfast earlier this month have decided to remain in the country. The rest are returning home.